Girl with Cloudy Head: Book or ebook? Which one is better? 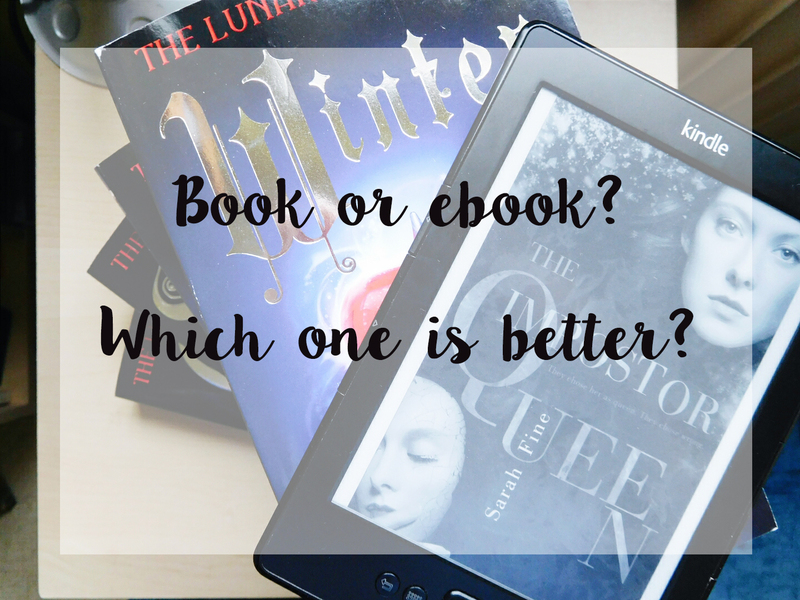 Book or ebook? Which one is better? 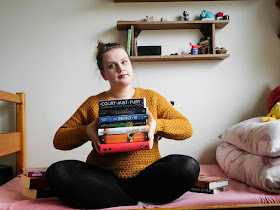 Welcome to the blog post in which I declare my love to books because they are adorable bundles of joy and they smell good and oh my the feeling of turning the next page, not knowing what's going to happen. How can ebooks even compare? They don't smell nice. You turn pages by clicking. You cannot randomly shut the book and admire the beautiful cover. I mean... you can, but it's a lot harder. So, are real books really better? Let's look at that. 1. The smell. We all know how good real books can smell. When I get a new one, I immediately bury my nose in it. I cannot be the only one. Right? RIGHT?! 2. The feeling when you hold it while reading. Ok, can we agree that there's nothing better than sitting in your favourite reading place and have the actual copy in your hands? Maybe have your favourite snack at the reach of your hand. Yeah, that's the perfect moment. Just imagine that hard spine and the paper under your fingertips... and don't let me start on the way the paperbacks bend. 3. The fact that you can appreciate them standing in your bookshelf. I love looking at my bookshelf and it's not just because my granpa made it for me. When I see how it overflows with beautiful books that are dear to me and mean so much to me, my heart melts. 4. It easier and more fun to take photos of real books. Have you seen the amazingness that is bookstagram? People are so talented with composition and they have incredible ideas when it comes to book photography. But have you seen ebooks there? Because I haven't. Maybe one or two and it's sad. I'm sure they want to model as much as real books! 5. NOTES! Ok, this one is totally personal preference but I love to write notes in the book when I'm reading it. I know, I know, it's barbaric, please don't kill me! I just love them sooo much I want to give them something in return and the something is piece of my chaotic mind and soul so basically it's beautiful thing to do, right? Again, please don't kill me. 2. You can take your whole library with you when travelling. Ereaders are actually really handy. I always pop them in my handbag when I go to school and it's awesome because they are light and I can read whenever I want. Even during the boring lecture that last for two hours. And I can pick whichever book I want!!! ISN'T THAT AMAZING?! Also, public transport is much more bearable with ebook in hand and I cannot read real book while standing in the bus - I'm clumsy and it would end up badly either for me or for the book. Or the passangers. Basically, it would be one painful mess. 3. Ebook are cheaper. Yeah, we pay for a digital file but still, it's cheaper than the real book. I buy ebooks especially when I'm not sure if I'll like it because I don't know the author or for some other reason. Also, there's netgalley or amazing deals on amazon. There's this bookbub thing that will send you email with amazon discounts and notifications which is pretty cool. 4. You won't get cramps while holding it. I'm sure you've all had a really heavy book that was nearly painful to hold in your hands. Well, that won't happen when reading the ebook. I mean, I like to workout my arms but in the gym not while reading. That's probably after my gym time and I'm too weak to even lift the page. 5. It shows you how much percent you have left. I like to track my progress and how fast I'm reading because I'm obssessed with improving my speed and it's easier to look at percents rather then count how many pages I've read in 10 minutes. It save time! But that's probably just my weird obssession. All in all, it depends on YOUR personal preference. Whether you like only book or only ebook, or like me, you love both of them the same, it doesn't really matter. What matters is that we are reading amazing stories and for all I care, you can read on your phone or computer or even listen to the audiobook. I constantly hear hate on ebooks because they are not real and yada yada yada. But why cann't we except that we're all different and we like to read differently? I use my ebook almost every single day and I also give love to my real books. Everyone is happy and dancing on the rainbow clouds. Ok, now it's your time to tell me what is your preference. Do you like real books or ebooks? Are you fan of both? Would you add something to the pros? Yess, I like how you summed up this post SO sO MUCH. I agree! There are positives to BOTh of them and tbh, I don't even want to have to pick! :D Ebooks give me a lot of opportunities -- like being able to read eARCs. If I wasn't signed up to Netgalley or Edelweiss, I would miss out on reading a lot of books because my library isn't that great and I'm a poor bookworm. XD I also read on my iPod, which is tiny, so when I'm super tired it's sooo nice to curl up in my bed with my kindle instead of trying to wrangle a huge paperback. BUT HARDCOVERS AND PAPERBACKS ARE STILL ULTIMATELY MY LIFE. I love to photography them and stroke them and smell them and I just love how bookish it is to have a room of books. The worst part about a kindle is how you can't display the books you like to read!! Yes, I agree, Netgalley helped me too because I tend to read more english books than slovak ones. There are definite pros to both of them! Personally I prefer physical books, because for some reason eBooks can give me headaches? Plus I love how physical books smell, and I love taking photos of them. But then I can't help but also love the convenience of eBooks! So both are really great! I really enjoyed reading this post! I think I prefer physical books, but I am quite biased because I've never actually tried an Ebook. I just love to cozy up with a nice big book in my hands (but I do get book cramps ALL OF THE TIME).